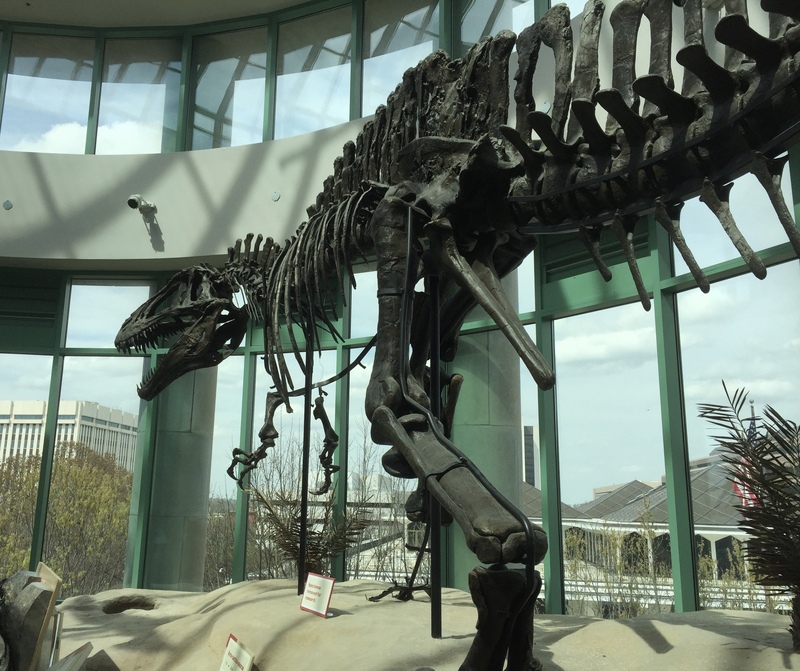 Well, it was supposed to be a working trip—no prehistoric shenanigans allowed. 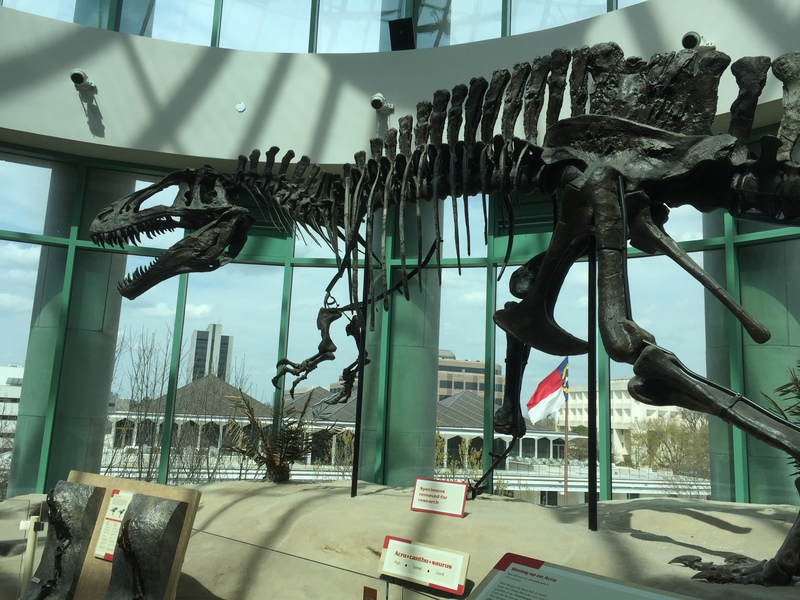 But it turns out the North Carolina Museum of Natural Sciences is practically right across the street from the state archives. I took it as a sign. 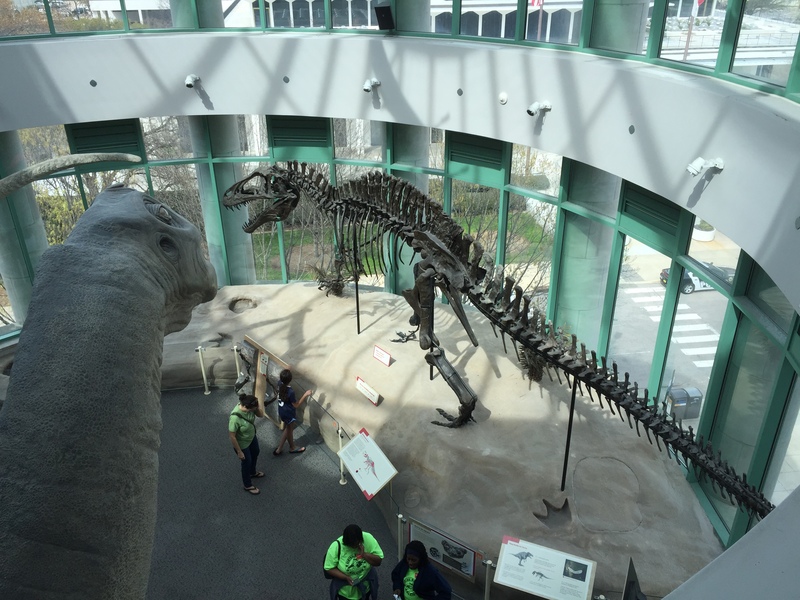 A most welcome sign, too, because the NCMNS has two dinosaur specimens I’d wanted to see in person for a long time. 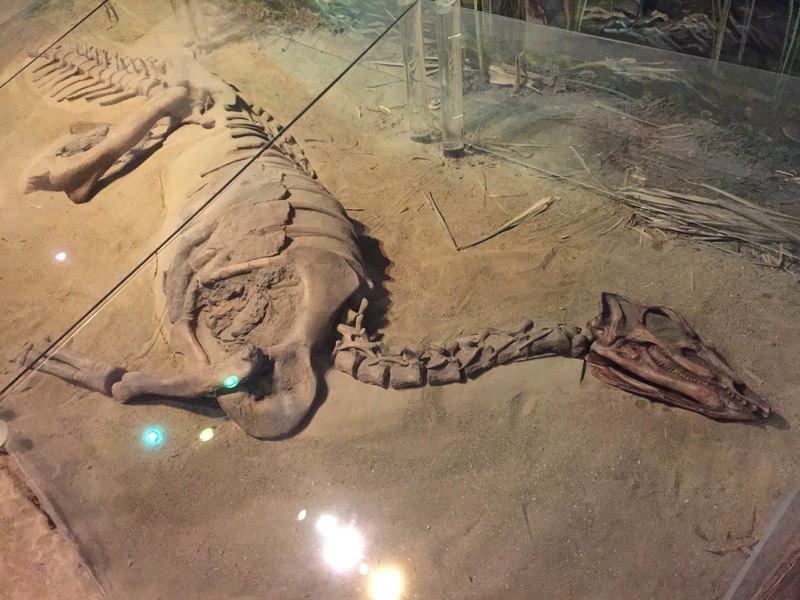 The first is “Willo,” a remarkable Thescelosaurus from South Dakota. This guy (gal?) was all over the news back in 2000 due to a claim that the stony mass under the shoulder blade was actually a petrified heart. Other researchers have argued that it’s just a concretion. Either way, Willo is a really neat fossil. 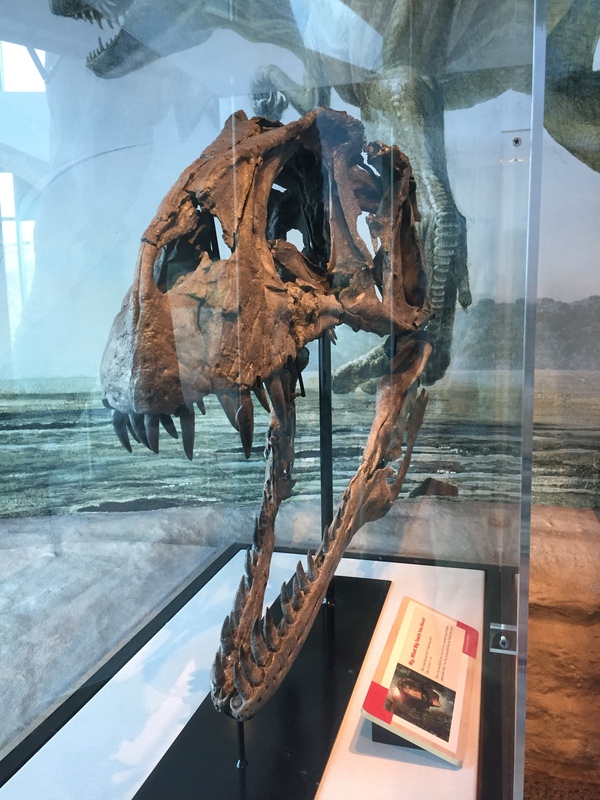 The other dino I wanted to check out was the world’s largest and most complete Acrocanthosaurus, a massive Early Cretaceous meat-eater famous for the spines along its neck and back. Note that some of the bones are missing. 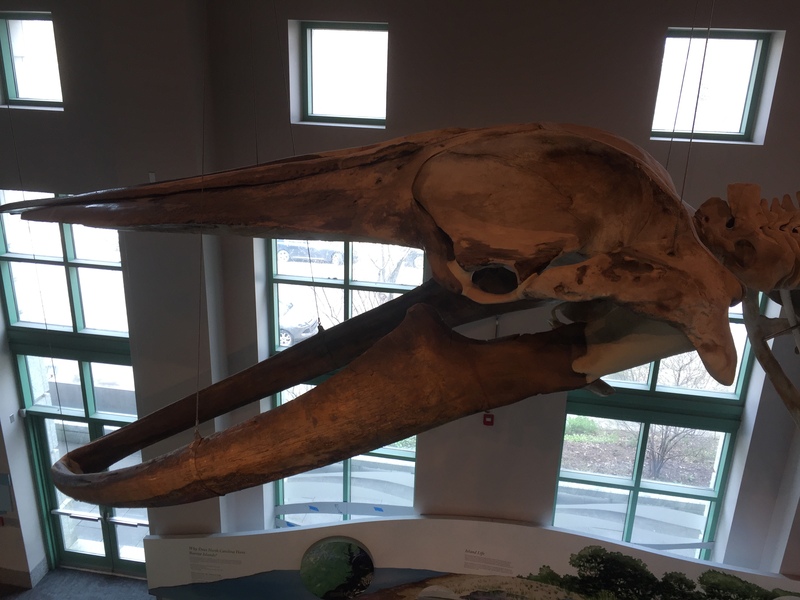 I think the museum is replacing the original fossils in the mount with replicas because of the preservation conditions in the exhibit space, so if you want to see the genuine article, you’d better do it sooner rather than later. The original skull is in a case nearby, and it’s a beauty. 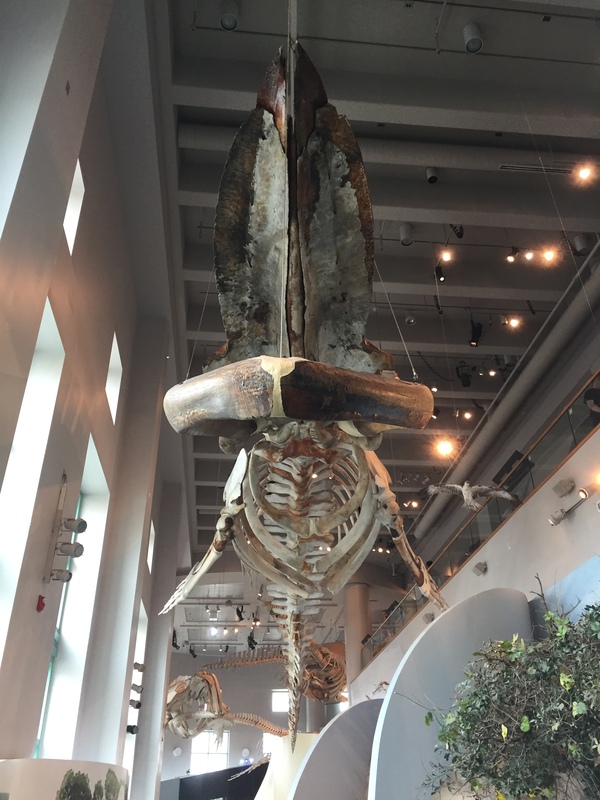 The acro shares its gallery with an Astrodon. Those wicked teeth have already ripped a chunk out of the sauropod’s hindquarters, and it looks like the acro is going to make another lunge. The dinos alone were well worth the stroll over from the archives, but this ginormous ground sloth is one of the most impressive fossil mammals I’ve ever seen. 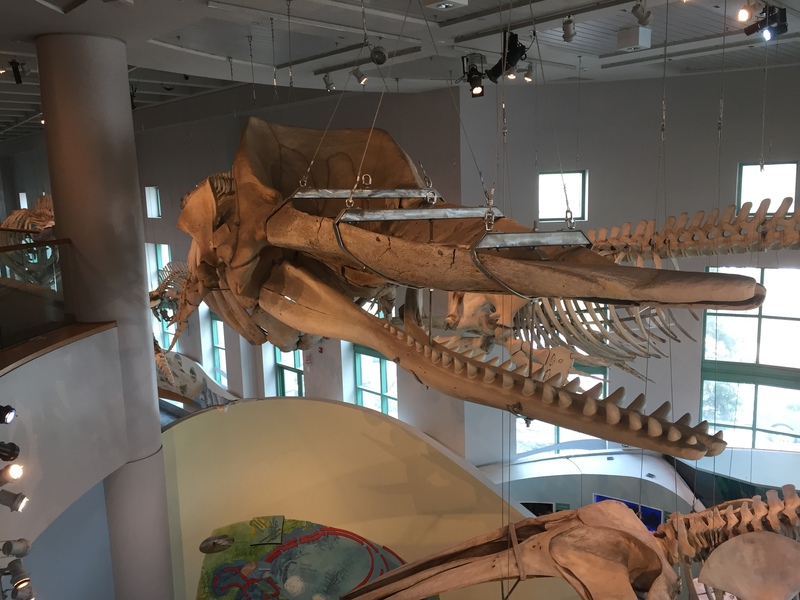 …and “Trouble,” the skeleton of a sperm whale that washed up on the Carolina coast in 1928. The name came from the ordeal museum personnel had getting the bones back to Raleigh. 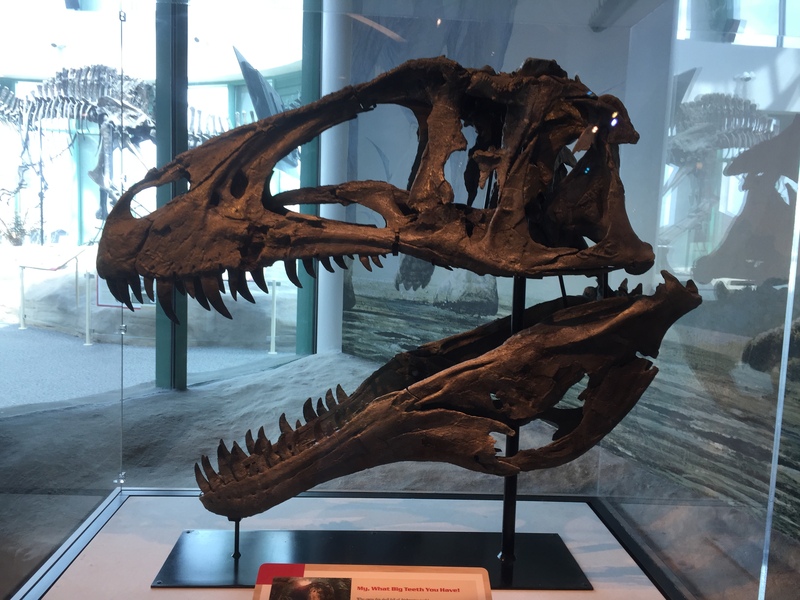 Fossil resources under threat, a volcanic trailer, two new theropods, and a tweeting tyrannosaur. It’s all in today’s Gratuitous Dinosaur Post. ITEM THE FIRST: You’ve probably heard about the Trump administration’s move to slash land away from Bears Ears National Monument and Grand Staircase-National Monument. What you may not know is that the two sites are paleontological treasure troves. In fact, their spectacular fossil resources helped get them established as national monuments in the first place. When Grand Staircase-Escalante was set aside, there were very few areas anywhere in the world where we had a mammal fossil record right at the late Cretaceous period, when different mammal groups were diverging. Those fossils really filled a gap in mammal paleontology and put Grand Staircase on the map from a paleontological point of view. We now have the most extraordinary Late Cretaceous ecosystem documented anywhere. After the monument was established, a lot of the dinosaur material was discovered. In Bears Ears, the very oldest and the very youngest fossils have been excluded, including one area that documents the transition from amphibians to true reptiles. In Grand Staircase, they’ve hacked off most of the very southern edge of the monument and the very eastern edge. That cuts out a really important interval in time, including the world’s greatest mass extinction, and the Triassic period, which is really when life started re-evolving again. Some of the mammal-bearing units I just described are out in their entirety. One of the great ironies is that the original localities where all the great discoveries were made in the 1980s and 1990s, which led to the founding of the monument, are now out of the monument. [But on BLM lands managed for multiple uses,] if there’s another competing use the paleontology does not necessarily hold sway. An extreme example would be mining—if mining wins out, then the fossils can be destroyed. Second, the monument is better staffed, so it’s harder for someone to sneak in illegally and take things, whereas on ordinary BLM land it’s much less well policed. Third, in national monuments where paleontology is one of the designated resources, there’s a whole special funding stream for research. A lot of the work that has been done at Grand Staircase has essentially been a public-private partnership. The funding through the monument has really made the science there blossom; we would not have seen the level or number of finds there over the last 20 years had that not existed. ITEM THE SECOND: Now, how ’bout that Fallen Kingdom trailer? As far as first trailers go, I like this one a lot better than Jurassic World‘s. JW‘s trailer, I think, gave away a bit too much. Revealing the helicopter crash in the aviary was especially unfortunate. 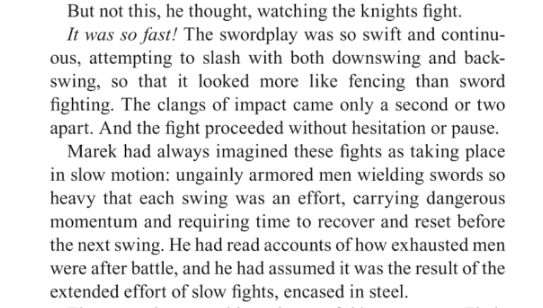 It undercut a lot of the shock we should’ve felt at Masrani’s death. One thing the trailer does reveal is a ginormous volcanic eruption that triggers a dinosaur stampede. 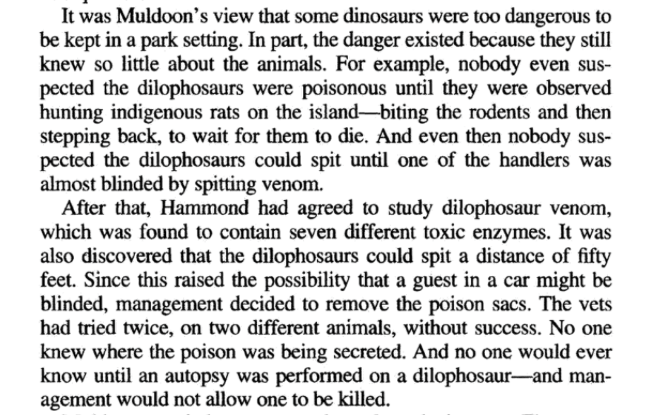 This prehistoric plot trope dates back to the very dawn of dino movies, having been depicted in the 1925 adaptation of Sir Arthur Conan Doyle’s The Lost World. But I don’t think it’s ever been done as impressively as this. The Baryonyx at 00:58 has been generating most of the buzz on the Interwebs, but I’m especially glad to see Carnotaurus finally making its debut in the film series. 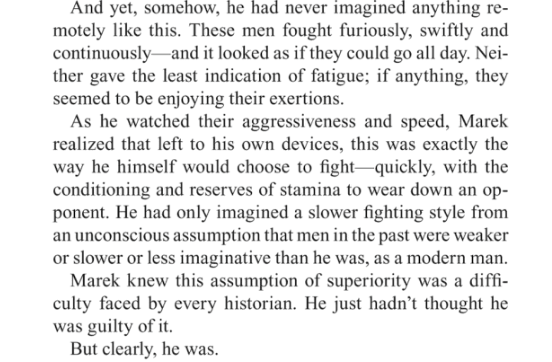 Crichton featured this genus in the second novel, so it’s high time it showed up in the movies. Fans have also been speculating about the identity of that carnivore at 1:51. It looks a lot like an Allosaurus. As a longtime allo fan, I’d love to see it in a JP movie, but it does seem a little odd to add such a standard carnosaur to a film franchise that already has quite a few big meat-eaters. With so many weird theropods out there, you’d think they’d want to showcase some of the more offbeat ones. Then again, since Allosaurus fossils are plentiful, I suppose it’s as likely to turn up in a dinosaur theme park as any other big predator. ITEM THE THIRD: Halszkaraptor, the newly christened, semi-aquatic theropod from Mongolia, had a goose’s neck, a raptor’s claws, and a snout full of sensors like a crocodile’s. Convergent evolution is a heck of a thing. ITEM THE FOURTH: One of the most famous fossils in Haarlem’s Teylers Museum is getting a new name…again. 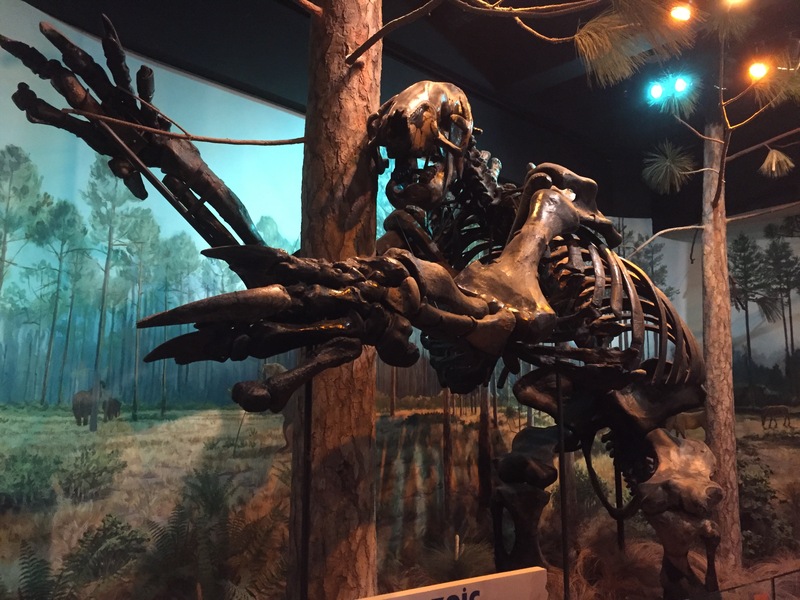 In 1970, while examining the museum’s pterosaur collection, John Ostrom determined that its type specimen of Pterodactylus crassipes wasn’t a pterodactyl at all, but an Archaeopteryx. 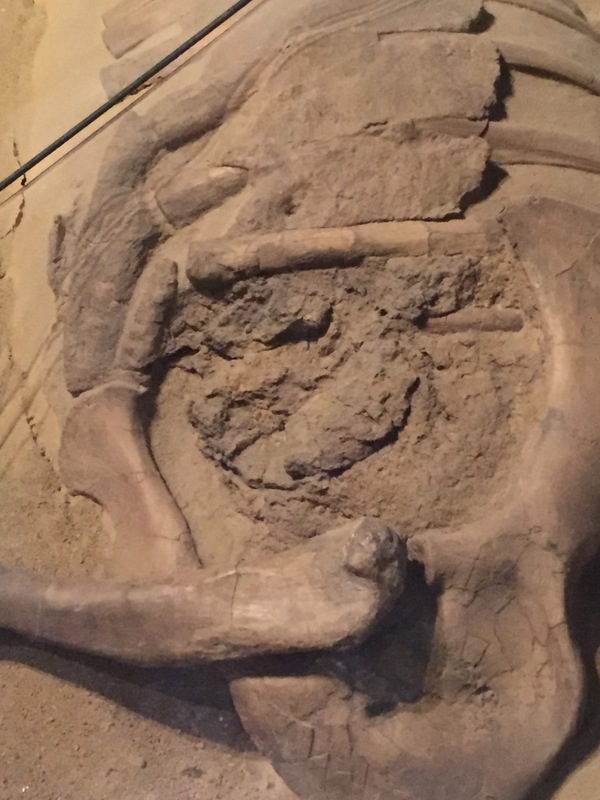 Now a team of researchers has identified the Teylers fossil as a new genus of dinosaur, which they’ve named Ostromia crassipes. There may be some behind-the-scenes hijinks while I’m off display getting ready to be remounted. As a (temporarily) disembodied rage emu, I can roam the halls and maybe check in on the new 122-foot-long sauropod playing door greeter. That is, if it can ever shut up about “going vegan.” WE GET IT YOU EAT KALE [leaf emoji]. Also, did you know less than 1 percent of The Field Museum’s collections are on public display? With some free time on my tiny, but powerful, hands I will finally be able to see EVERY rove beetle we have. And buddy…DEMS A LOT OF ROVE BEETLES. 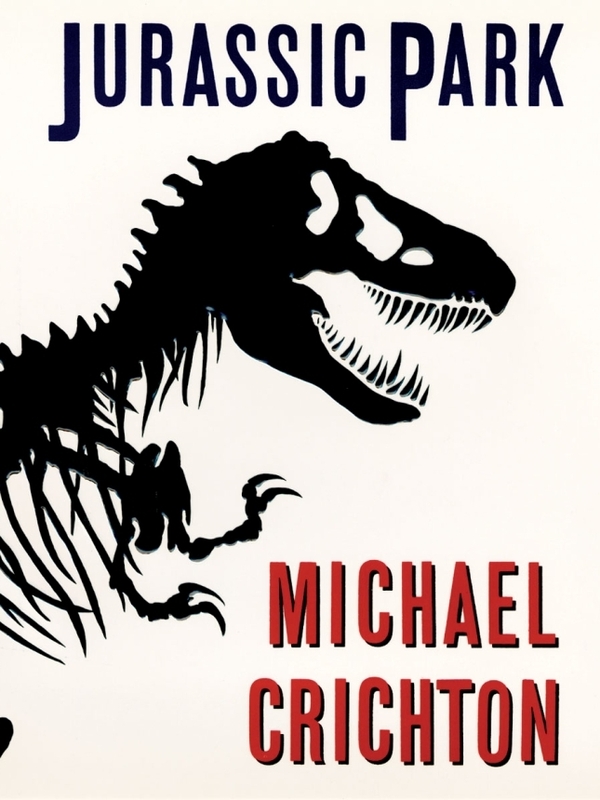 GDP: Did you know there’s a thriller about a dinosaur dig opening this week? Just found out about it myself. It’s called Valley of Bones. I’m not buying that skull, but the movie looks interesting. Today’s Gratuitous Dinosaur Post brings sad tidings. As of this weekend, the Universe of Energy at Disney World’s Epcot is no more, and with it goes its animatronic menagerie of prehistoric beasts. If you prefer your nostalgia in tangible form, they’re selling some commemorative merchandise. In its original version, the attraction represented a lot that was off-putting about Epcot. The theater segments on energy sources were so stodgy, so infused with belabored portentousness, that they made Spaceship Earth look like Mr. Toad’s Wild Ride. The last film seemed to drag on so long that you almost expected the continents to have a different arrangement by the time it was over. But oh my, those dinosaurs. Sure, they’re outdated now; they were already a bit behind the science when Disney rolled them out in 1982. They wouldn’t have been out of place in a Charles R. Knight painting ca. 1900. But they were dead ringers for the dinosaurs pictured in the books I read as a kid, except they were right there, in three dimensions, feeding and fighting and roaring their way through a three-dimensional primordial landscape. I was still in elementary school the first time I rode U of E, and I don’t think I’ll ever forget that moment when the curtain rose on a family of grazing sauropods and the theater seats started gliding into a swamp that you could literally smell. It was awe-inspiring. I had mixed feelings about the 1996 overhaul. The new theatrical segments with Ellen DeGeneres and Bill Nye were genuinely funny, and much more engaging than their predecessors. But I didn’t care for Ellen’s animatronic cameo during the ride. The elasmosaur seemed so menacing when I was young that it irked me to see him played for laughs. Still, I guess the updates gave the ride a new lease on life. Its replacement will be a Guardians of the Galaxy attraction. I have mixed feelings about that, too. The Guardians movies are a lot of fun, but between Disney’s acquisitions of Marvel and Star Wars, the parks are starting to look less like coherent themed areas and more like a patchwork of intellectual properties. U of E’s last bow didn’t go off without a hitch. 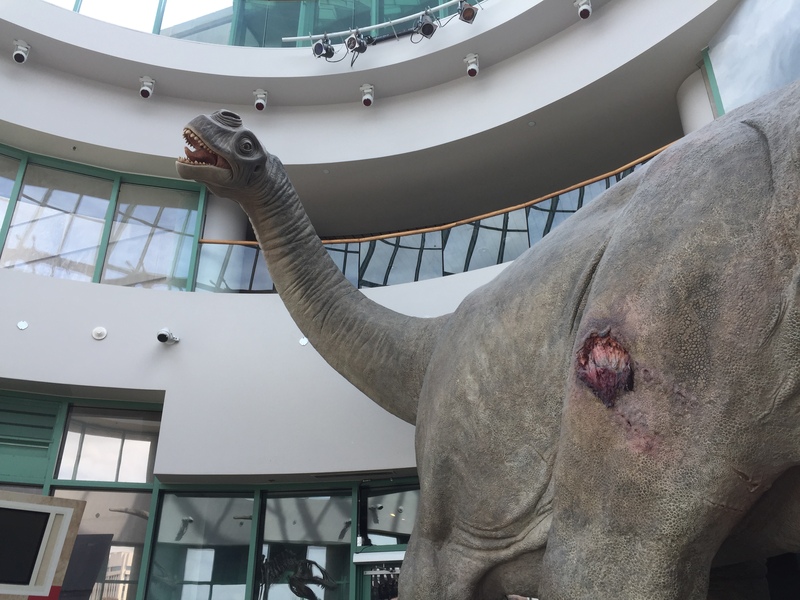 It shut down during the sauropod scene, forcing the visitors to evacuate. But the upside is that somebody was on hand to take video, giving us an up-close and well-lit glimpse at the dinosaurs. We’ve still got the dino ride at Animal Kingdom, assuming they don’t tear it down for an Avatar expansion.